Of course, none of this would have been possible without our incredible DLC team, which will continue to push new boundaries for players in "Beast of Winter" and other upcoming DLC's. We interrupted their busy lives for a few moments to catch a glimpse of what it means to work on Deadfire's DLC in our newest Update video below, so take a look! See what Rymrgand's Harbingers have in store for you on Steam, Gog, or Origin. In our most recent stream, "Beast of Winter" Game Director, Brandon Adler, and Lead Producer, Alec Frey, showed off more of the "Beast of Winter" DLC as well as some new features coming with Patch 2.0. We also got to see mods in action as QA Tester, Andy Artz, showed off his "Producer Mod" to great effect. Be sure to check out the video for fun insights on the development of "Beast of Winter". As always, if you subscribe to our channel on Twitch, you get access to emotes that you can then use across all of Twitch. All money we receive from Twitch subscriptions and cheers goes to benefit the Children's Hospital of Orange County. You can also donate to our Extra Life team and help raise money for the children's hospital that way. We'll be doing a marathon stream in November where we'll have an entire weekend of games and special guests while raising money for a great cause, so be sure to join us then as well. Do it "For the chids!" Going to Gamescom this year? Keep an eye out for Game Directors, Josh Sawyer and Brandon Adler, who will be on the show floor showing off Deadfire and talking to press. We'll also be doing a panel at PAX West this year on September 2nd! We'll be discussing how we bring characters from conception, to in-game for "Beast of Winter" and will be taking questions from the audience. The theater is open to anyone at the convention and will be streamed, so come by, hear from members of the "Beast of Winter" team, ask us questions, and hang out with us afterwards for a bit! Our friends over at Critical Role recently did a live stream from their new Twitch channel where Matthew Mercer showed off how to create Vox Machina in Pillars of Eternity II: Deadfire. If you missed the live stream, the video is now up on their YouTube channel so you can watch it any time. 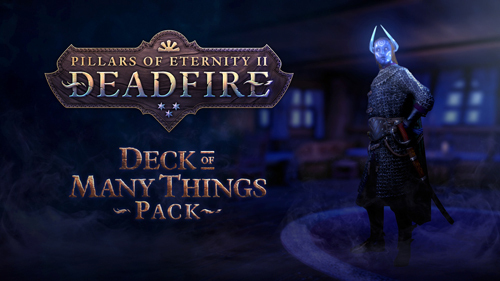 As an added bonus, they also released a fun commercial for Pillars of Eternity II: Deadfire and Critical Role that we can't get enough of! If you're so inclined to take a leaf out of Matthew Mercer's book and create a party of Vox Machina for yourself, the "Critical Role" DLC pack is available on Steam, GOG, Origin, and Macplay! 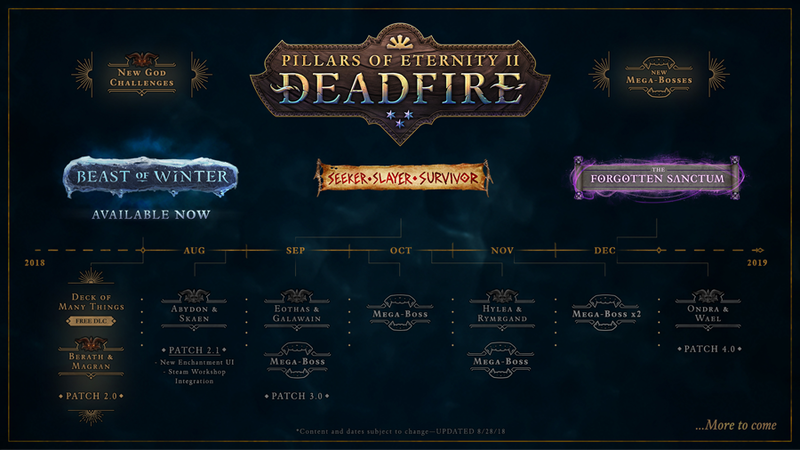 As we posted on our forum, we sincerely apologize for the lack of updates over the past few weeks - without your interest and faith in us, Deadfire could never have become what it is today and you deserve better from us. We wanted to have firmer dates to communicate with you before our newest update, but we realize now that the lack of communication was worse than the lack of firm dates. With that, we need and must do a better job updating all of you on what's going on. With regards to current status, for those of you in North America, South America, and Oceania, our Ohio distributor has confirmed that they are sending shipments out starting early next week. Unfortunately, our fulfillment center for the rest of the world let us know recently, that they can no longer handle fulfilling for us and we're working on an agreement with a promising vendor in the coming days, with expediency in mind. Going forward, every Monday (and more often as news arrives), we will update this support thread with the latest information we have. If you're ever curious about what is going on, we will update this page with the latest status. Thank you most sincerely again for your patience and we promise to do a better job of keeping all of you updated. The community has voted and your weapon is in the game! There is a new hunting bow available for purchase in Henric's shop in Port Maje. Beware, however - the animancer that created this bow may not have fully understood what they were doing and results may...vary. 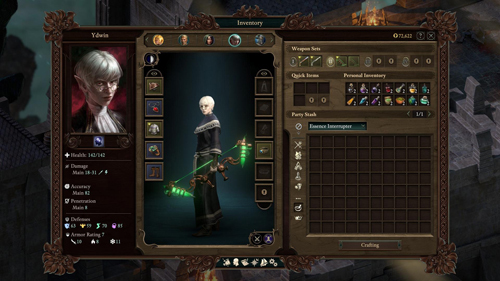 In case you missed it, our own Andy Artz created a mod to show off the capabilities of modding Deadfire. 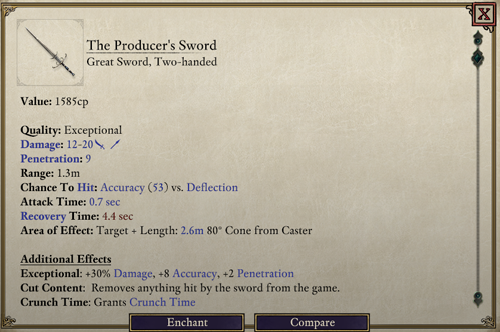 The Producer's Sword was debuted during our stream last week, and can be found up on the Nexus. The Bloody Blossom, a modded pollaxe that was also used during the stream, was modded by Mortimermcmire and can also be found at Nexus Mods. Its OUT! GOG, stop checking local files and update already. Edited by Wormerine, 02 August 2018 - 09:05 AM. Color me hyped for the entire roadmap, and especially so the mega bosses! So much hype in that roadmap. Awesome work, everyone! Yeah, I am hyped too, but...what is this? Nice update. I like the road map, with super bosses, and at the end, "more to come"
Going to be enjoying this update. Plus I'm pretty hyped for this roadmap too (really looking forward to the mega bosses). Edited by wolfrider100, 02 August 2018 - 09:48 AM. Thanks for bringing that up. I'll contact GOG to fix. Very nice indeed. But I am baffled, as I am not understanding how to start this DLC, nor do I seem to find any information on how to start it. oh no, another one where its in the old game, and one has to fiddle around to get to play the DLC, I should never have gone for the season pass, too much trouble. Will all DLCs be like this? Where or when can we get 'the deck of many things'? Can't see it on the GoG downloads page so far. stoked to hear about Mega-Bosses and am so pleased that Obsidian is continuing to improve POE2. It was a good game at release and I’m hopeful that it will be a terrific one by December. I randomly got the invite to see Vanti (my nickname for ol Handsome ) after I left The Deck of Many Things. Was probably just a random timer counter though as I was a supremely high level character near the end of Act 2. I haven't attempted to trigger it early or in other circumstances. Won't be able to do further testing on this until later today though, as I got some errands to run and a mod update to push out first. Edited by Zap Gun For Hire, 02 August 2018 - 11:26 AM.